A little bit of greenery goes a long way. 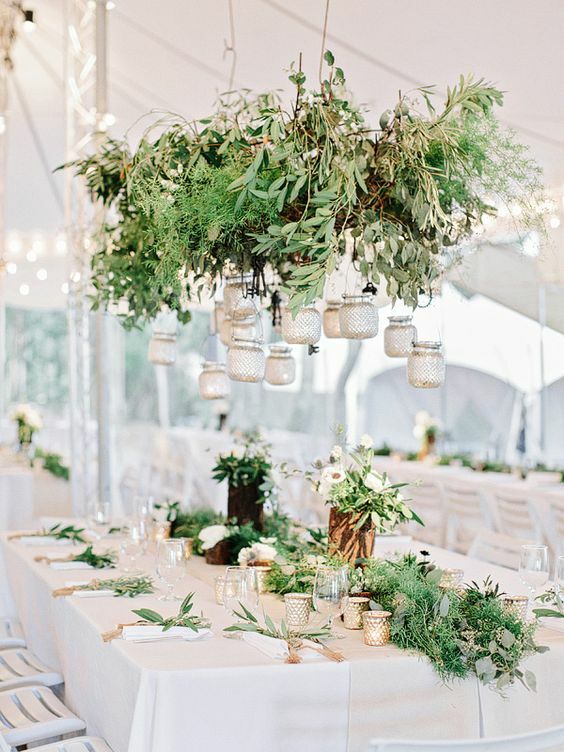 A whimsical, classic, natural, and elegant twist to weddings, greenery wedding chandeliers can add the perfect amount of sweet spice to a ceremony or reception. They’re a decorative piece everyone will take notice of. 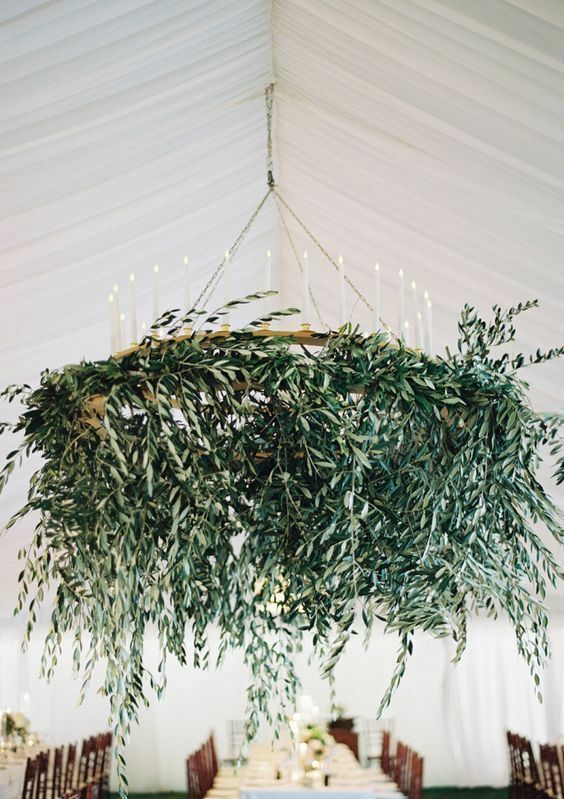 Here are 14 great ideas for greenery chandeliers for your wedding. 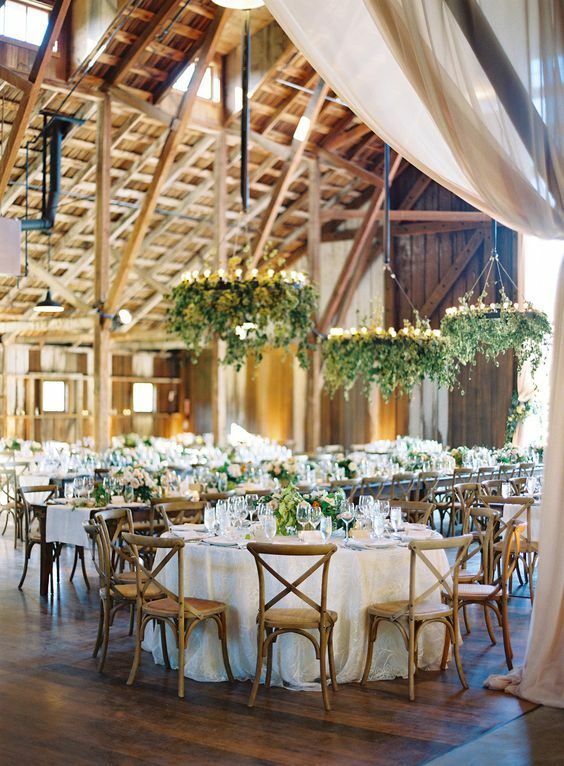 Place an abundance of green, leafy garlands around a circular candlelit chandelier for a vintage vibe. Wrap it around the ring securely so it looks like a wreath. 2. 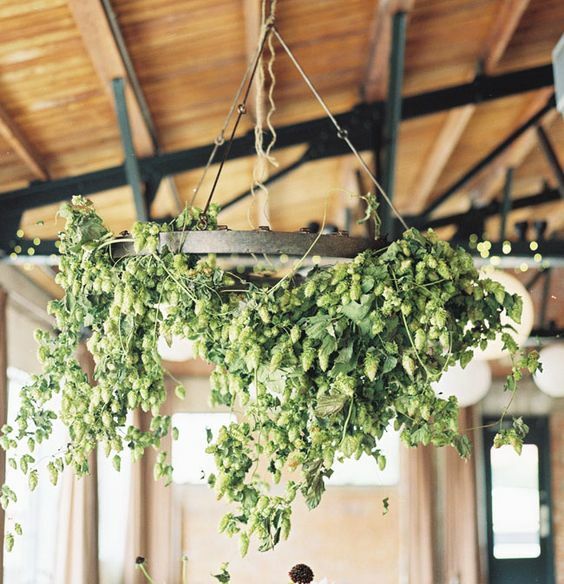 Use a dangling vine as a backdrop. 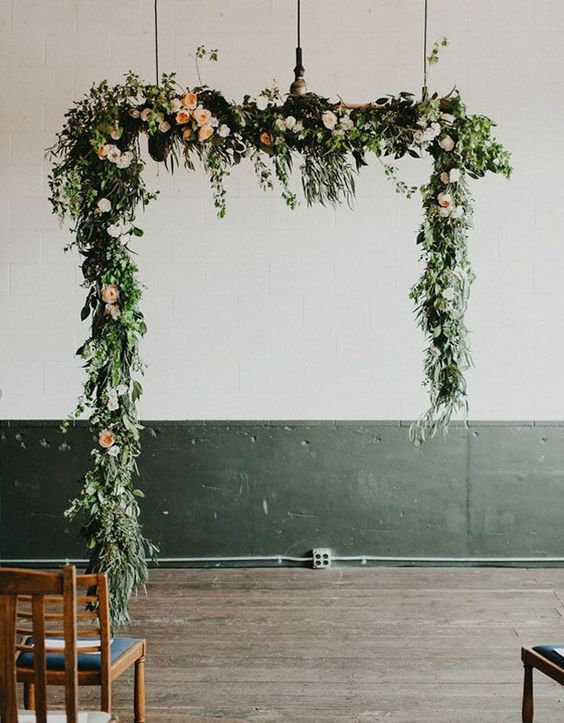 Hang a garland studded with subtle florals at an askew angle for an almost photo-frame-like effect! 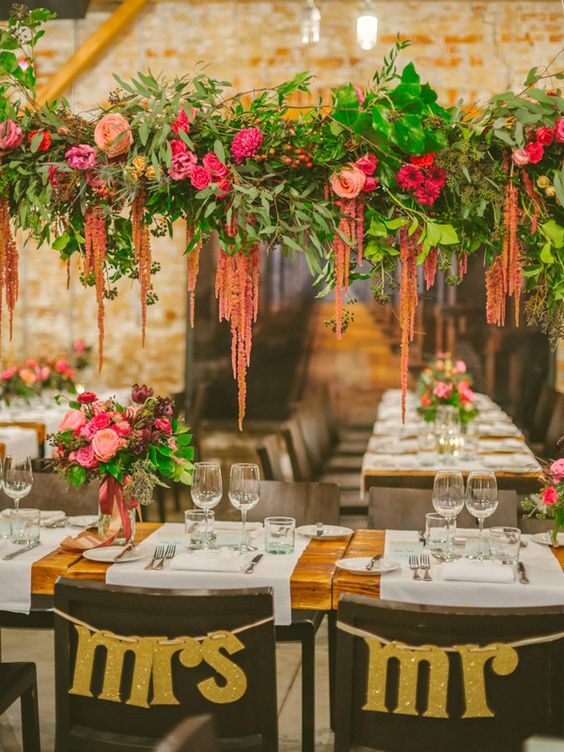 The mix of lush blooms + a totally industrial, sparse space is a juxtaposition worth swooning over. 3. Make it demure and romantic. 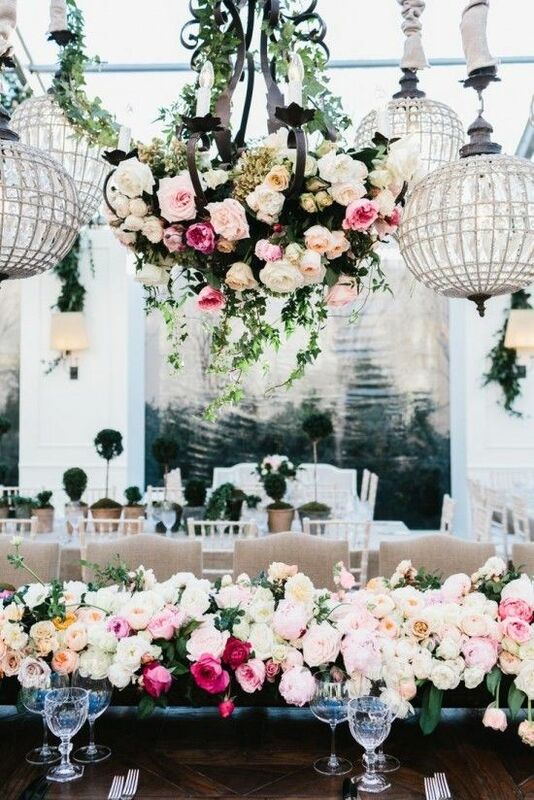 Fill a hollow ceiling decoration with white and pink roses to really make the atmosphere turn sweet! 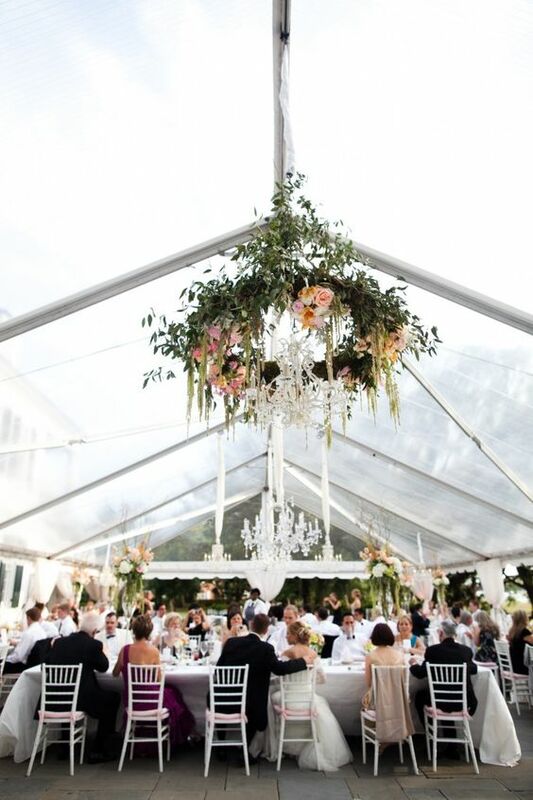 You can also surround the centerpiece with white lanterns and light the table beneath with similar florals. Wrap leafy vines loosely and sparsely around black candlelit chandeliers for an edgier appearance. Make sure you have plenty of them to dot the ceilings! 5. Create a hanging garden! To do this, hang a (well-supported!) box from the ceiling and completely fill it with greens and pastel florals. Don’t forget to make the box green by coating it with moss. Your guests will feel the magic as they dine beneath. 6. Let it all hang out. 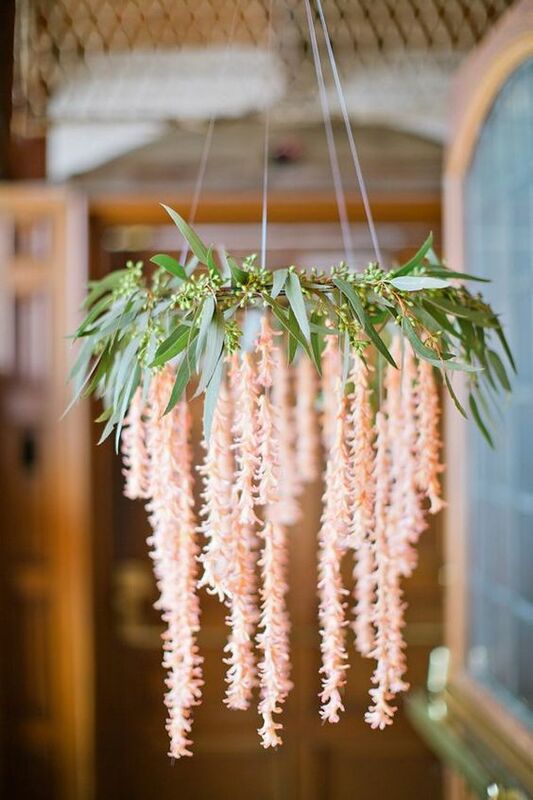 Go small and simple with circular leafy garlands and any kind of hanging flowers. We think orange looks especially pretty! 7. Create a matching, hanging jungle. 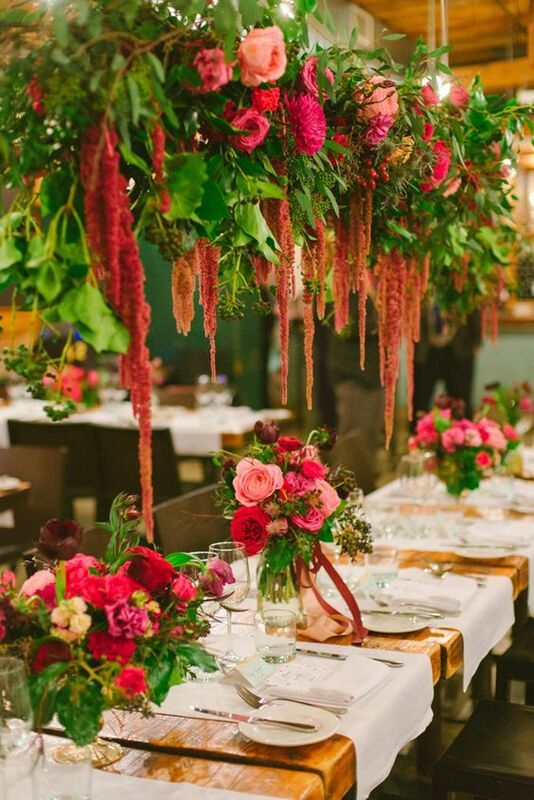 Fill the entire overheads of dining and reception tables with large amounts of leaves and greens and pink florals in many shades, then match them with the table centerpieces. 8. Go back to basics. Mossy light green leaves accented with brown can look just as gorgeous as flowers. 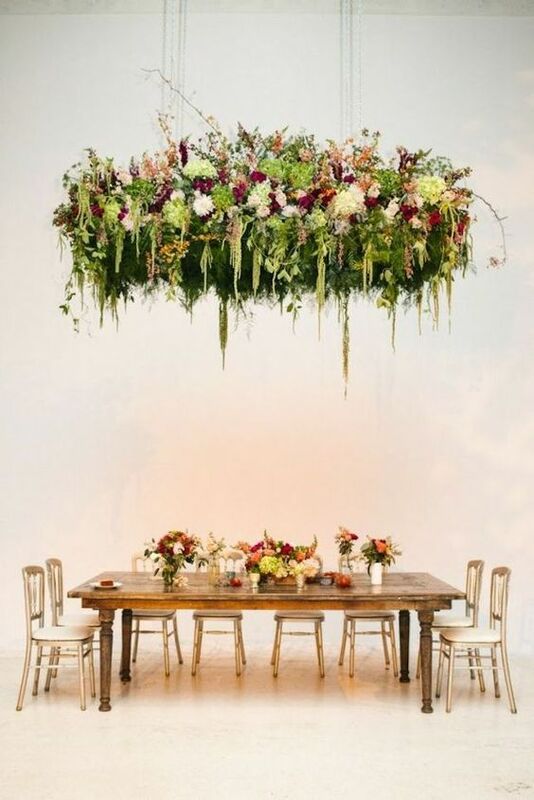 Hang a few white pots off the floating garlands and match it with table décor. 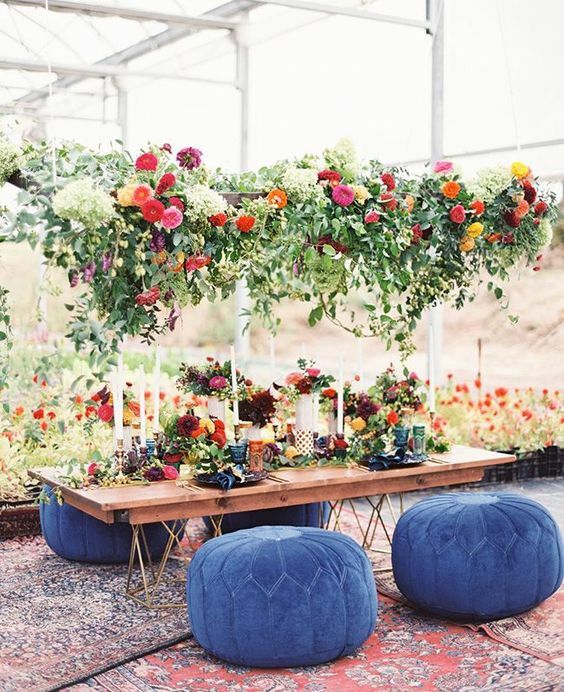 This wedding reception decorated with a hanging statement at the head table, thick green garlands with soft white rose accents, and touches of blue from the anemones and thistle. 9. Just go all out green! 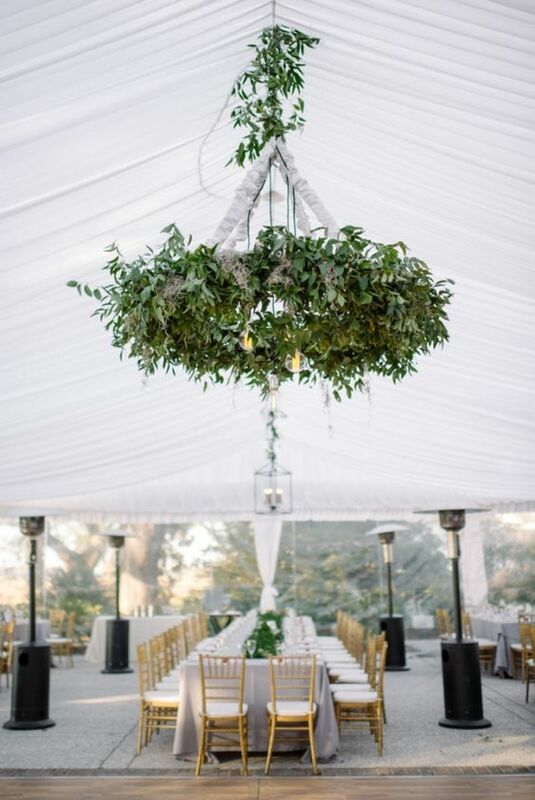 Green leaves, green flowers, green accents – let them hang from the ceiling like green grapes! 10. Go classic and intimate. 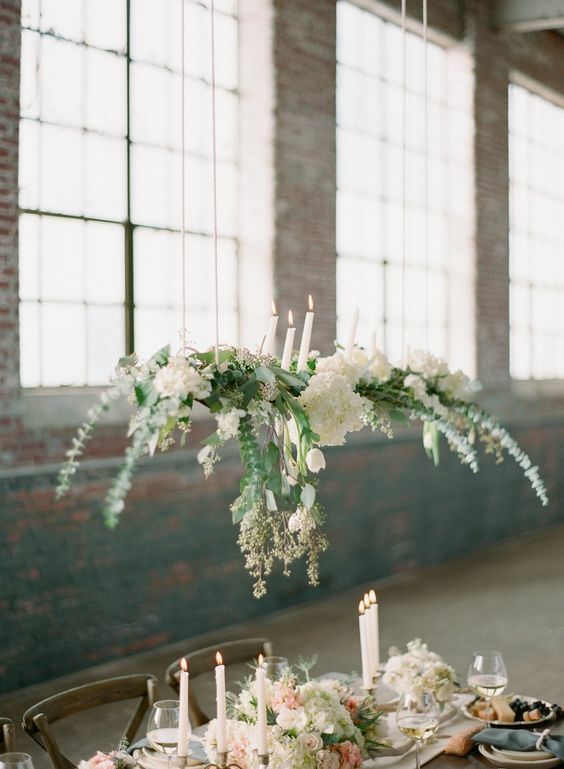 Hang white flowers with minimal greens low over tables, and top them off with white candles. 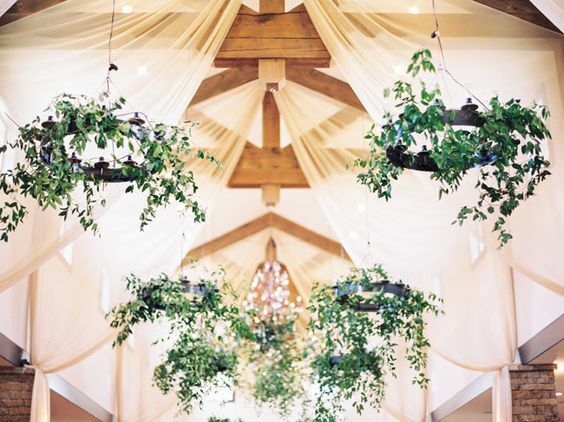 How are you using Greenery wedding chandeliers to decorate your wedding? We’re dying to hear your top tips!